TV with Thinus: 21st Century Group: We’re suing Taraji P. Henson’s 42West over Women in Media Conference 2018. 21st Century Group: We’re suing Taraji P. Henson’s 42West over Women in Media Conference 2018. 21st Century Group, organisers of the now-controversial International Women in Media Conference 2018 says it will be suing Taraji P. Henson's management and a place called Superstar Agency after the 21st Century Group claimed that Taraji P .Henson and Halle Berry would be A-list attendees, only for Henson to call it fake advertising and saying she won’t attend. On Wednesday scandal erupted around the planned conference, set for 5 and 6 September at the Sandton Convention Centre, when Taraji P. Henson publicly slammed the conference as "fake advertising" and demanded the removal of her name and likeness, after which Halle Berry’s name also disappeared and the South African celebrity Bonang Matheba, also attached as one of the South African A-listers, dumped and distanced herself from the event. 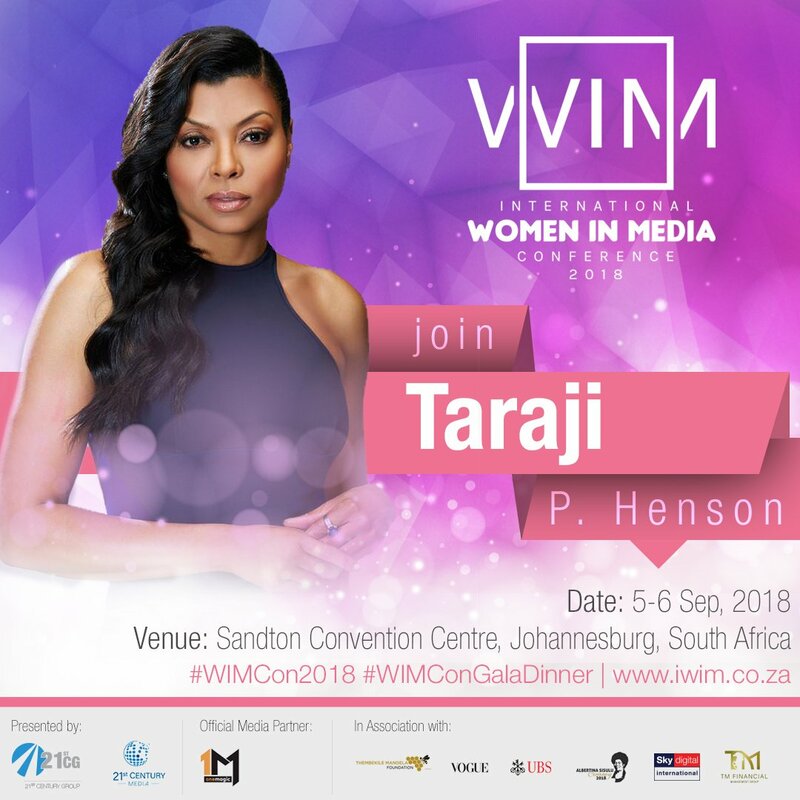 Meanwhile Webtickets told TVwithThinus in response to a media enquiry on Thursday that it has halted all ticket sales for the conference that promised attendees a stellar line-up of Bonang Matheba, the Empire star Taraji P. Henson, Halle Berry, Amanda du Pont, Connie Ferguson, Ashanti, Carte Blanche’s Claire Mawisa, Salamina Mosese and Thabile Ngwato as some of the headliners. Taraji P. Henson, who visited South Africa previously as part of a publicity blitz in mid-2016 for Fox Networks Group UK & Africa’s FOX (DStv 125 / StarSat 131 / Cell C black 201) channel, said that she is working on Empire, isn't part of the conference, and want her name and likeness removed from it. Taraji P. Henson on social media said "False! I will not be there. Never heard of this event and was never invited. Please remove my name from this event because it is false," and that "I am working on Empire. It is impossible for me to be there. I hate that this organisation is misleading my fans." She said her "team would never agree to anything on my behalf without me knowing. That is not how I run my business." Tickets with an eye-watering price of R1250 went on sale for the conference that said it want to help women in the business of film and TV production, the art of acting and presenting and “how to make it in Hollywood”, with M-Net’s 1Magic (DStv 103) channel listed as the event’s official “media partner”. On Friday morning the Sandton Convention Centre’s online events calendar showed no entries on 5 and 6 September for the conference. On Friday Webtickets continued to list the event on its website as including “international media mogul Taraji P. Henson”. While 21st Century Group in a statement late Wednesday night said “no tickets were sold, and no tickets will be sold, it’s strictly by invitation”, several people said they had already bought the expensive tickets. Webtickets told TVwithThinus that “sales have been closed in the interim”, didn’t want to say how many tickets had already been sold and said “we cannot disclose this information as it is confidential between us and our client”. On Thursday afternoon in a statement posted on Twitter at 12:42 that was removed without explanation several hours later, 21st Century Group said that "Superstar Agency is the agency that booked Taraji P. Henson through her management, which is 42West PR. The engagement contract was signed by Susan Bymel on behalf of Superstar Agency. 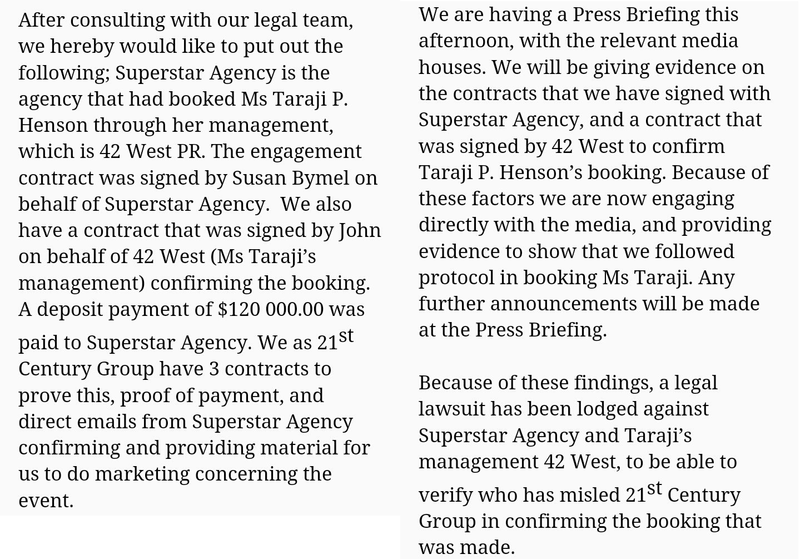 We also have a contract that was signed by John on behalf of 42West (Taraji’s management) confirming the booking. A deposit payment of $120 000 was paid to Superstar Agency." 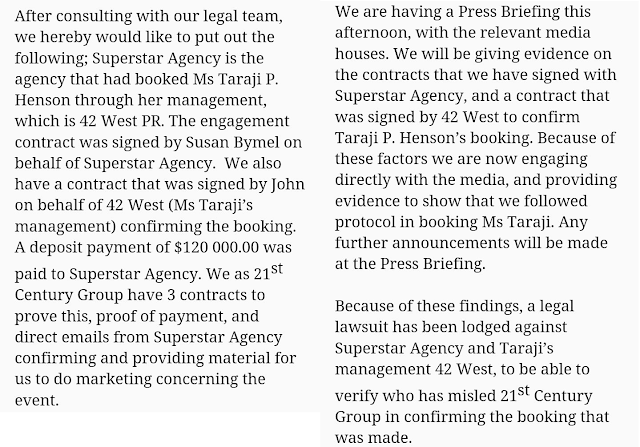 21st Century Group said that “a legal lawsuit” has now been lodged against Superstar Agency and Henson’s 42West management “to be able to verify who has misled 21st Century Group in confirming that the booking was made”. No press briefing however happened on Thursday. An internet search on Wednesday and Thursday couldn’t find a website for Superstar Agency. The American talent agent Suzan Bymel does exist, but her first name is spelled with a “z” and she is the co-founder of the Management 360 talent agency in the United States. On Friday morning, Julie Schulte, 21st Century Group sales director, in response to a media enquiry said it’s now taking “this situation through a legal route” and that a lawsuit has been launched against both agencies, saying it will “go into court within the next 14 days”. She said the reason Halle Berry’s name disappeared from the line-up is “because she’s managed by the same agency that confirmed this booking with Henson”. Regarding Bonang Matheba, Schulte said that “we have engaged with her management and they have agreed that once we re-open the marketing strategy they will come back onboard because they support the initiative of woman empowerment”.